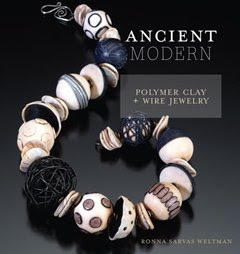 This is one of the most unique polymer clay books that I’ve seen! It begins with the usual solid information on materials, tools, and techniques that you’ll find in many books, but that’s where the similarity ends. Ronna’s style is primitive, organic, and full of joy. If you’ve been looking for opportunities to shed the rules and just see what happens, this may be the perfect book for you. The style of this jewelry will not be for everyone, so if you don’t care for the piece on the cover, it is very indicative of the style throughout. There’s lots of color inside, but it tends to be subdued and natural. The finished pieces are not pretty, but they are boldly arresting and intriguing.